For the first time since 2003, we won't have a Saw movie to kick around at Halloween. In its place, ready to dominate the weekend's box office is something far more frightening – an animated spinoff. Even after running the Shrek franchise into the ground and simultaneously exhausting the public's tolerance for Mike Myers, DreamWorks wasn't quite ready to let the multi-billion property simply fade away. 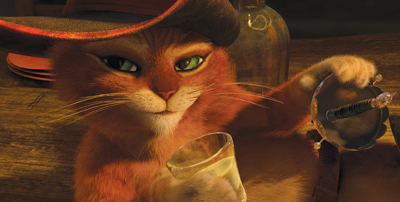 Thus, it was time to split off the remaining viable character, Puss in Boots, into his own movie before people forget they ever liked anything about Shrek. Voiced by Antonio Banderas, the character is sort of the series' Captain Jack Sparrow, a kind of dashing, fey swashbuckler (are there any other kinds? ), who just also happens to be a cat with the power of Anne Geddes eyes. Since it's still from the Shrek people, expect a lot of random pop culture references for no reason (I am shaking my fist at Family Guy for no particular reason, here), combined with a bunch of jokes about cat behavior, which are cute but not particularly deep. It's both surprising and not that they're not making much a deal about this film reuniting Banderas and Salma Hayek – surprising because studios rarely miss opportunities like this and not because it is in fact not a big deal. They, along with Zach Galifianakis and Billy Bob Thornton, make up the significant voice talent in the movie, though with as kiddie as this movie seems to trend, that hardly seems like it'll be that important. This feels like a Madagascar or a Happy Feet – a middle tier film that does ridiculous business in ancillary markets. For now, though, we have a weekend winning performance of around $44 million. In Time joins the illustrious list of films whose plots were thought of while high, which also includes Andrew Niccol's first film Gattaca, Waking Life, and of course, Citizen Kane. Set in a future where time literally equals money (I'd love to have seen how that got introduced), and no one ages past 25, the film follows Justin Timberlake as a blue-collar worker gifted a near infinite amount of time by a mysterious ...billionaire (? milleniaire? The lingo seems confusing), giving him the opportunity to engage in some class warfare – literally. Kidnapping the daughter (Amanda Seyfried) of one of the high society, he embarks on a crime spree of giving away time, which threatens to shake up the entire system, and makes him the enemy of the establishment (represented here by no-nonsense cop Cillian Murphy, and a punchable, slimy Vincent Kartheiser), which blah blah blah change the world. These high-concept sci-fi action films can be a tough sell, even with a high profile lead (which I hope we can agree that Timberlake now is), as audiences are notoriously reluctant to think during movies, and this feels like one of those movies that make you think about stuff. The most recent of these ideas to do only moderately well is Surrogates, which opened to about $15 million, and you can go back about ten years to a-then-still-relevant Schwarzenegger who opened The 6th Day to just $13 million. Big future-shock ideas just don't sell well. Look for this to stick in the same general area with about $13 million. Speaking of Captain Jack, his alter ego Johnny Depp does have an actual film out this weekend in which he has his share of debauchery and then some. The Rum Diary is a semi-autobiographical novel by Hunter S. Thompson (a long-time friend of Depp's prior to his suicide) about his time in Puerto Rico as a young journalist (hey kids, who can spot the problem here? ), which involved a lot of drinking, a little bit of stealing a businessman's fiery girlfriend (Amber Heard), some reporting, and some more drinking. It's a mostly plotless, meandering story that seems designed to test the love of Johnny Depp's fans, and identify just how many fans there are of Hunter S. Thompson's fiction (who are few but a passionate bunch).